The fact that prepared follows from God implies that God is the Preparer of the bride. Hebrews 11:16 agrees with this, saying that God “has prepared a city for them”—for those who live as sojourners on the earth while seeking a better country, a heavenly one (11:13-16). Some of the preparation has been done by the Triune God with no action by us, including incarnation, crucifixion, and resurrection. These steps are necessary to redeem us and to release the divine life so that it can enter into us. Without this redemption and life, there is no possibility for us to be prepared for New Jerusalem. After we receive this life, we need to cooperate with it. The word bride indicates a wedding feast, about which the Lord speaks in Matthew 25:1-13. In this parable the wise virgins gain the oil, a type of the Spirit, to fill their vessels. 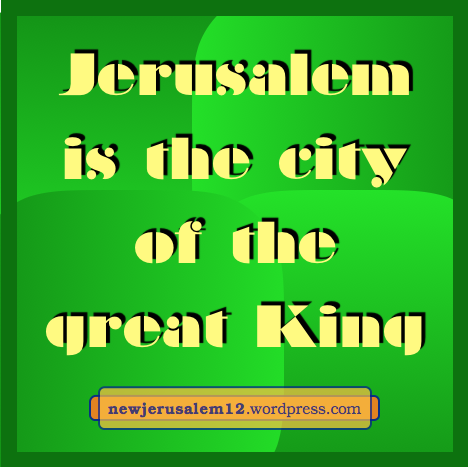 This filling is our cooperation with the preparation of New Jerusalem. This corresponds with being filled in spirit in Ephesians 5 which requires not being drunk with worldly pleasures and pursuits. This filling also depends on our singing with our heart to the Lord, speaking to one another, giving thanks to God, and submitting to one another. To be filled with the oil in every part of our begin results in our life and nature matching that of New Jerusalem, the city which is from God and of God. The prior two posts (one two) are about our rich inheritance from God and God’s inheritance of His riches in us. 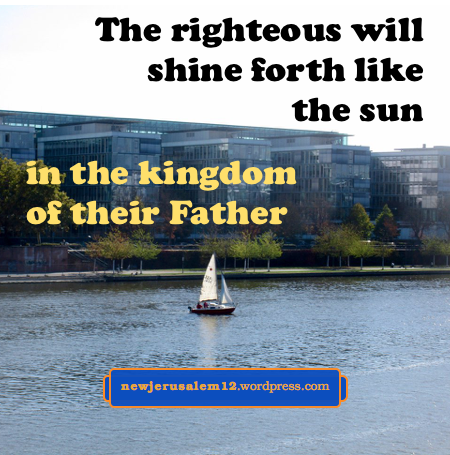 All of this inheritance, whether now or in the next age, points to New Jerusalem. A big part of this inheritance is eternal life. The Lord Jesus says, “Everyone who has left houses or brothers or sisters or father or mother or children or fields for My name’s sake shall receive a hundred times as much and shall inherit eternal life” (Matt. 19:29). 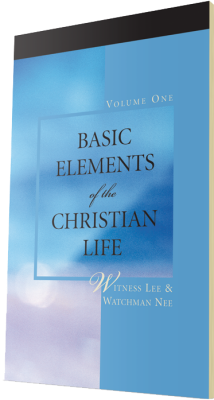 To inherit eternal life is to be rewarded in the coming age (Luke 18:29-30) with the enjoyment of the divine life in the manifestation of the kingdom of the heavens. To have eternal life in John is to be saved with God’s uncreated life that man may live by this life today and for eternity, whereas to have eternal life in Matthew is to participate in the reality of the kingdom of the heavens in this age and to share in its manifestation in the coming age. 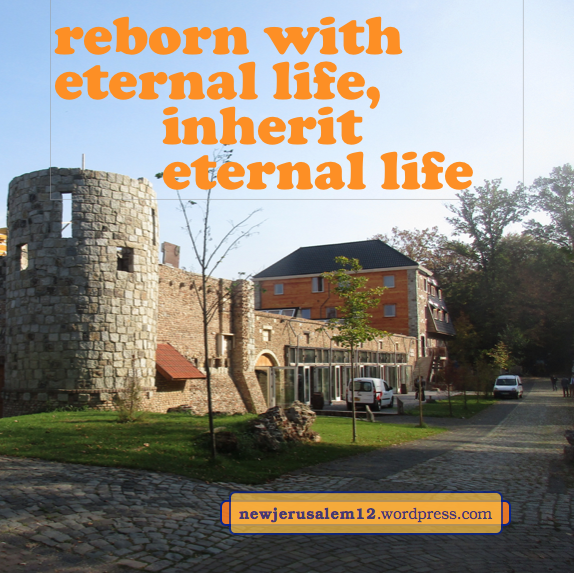 Eventually this eternal life brings us to New Jerusalem that we may live this life and reign with God and the Lamb for eternity (Rev. 22:3-5). 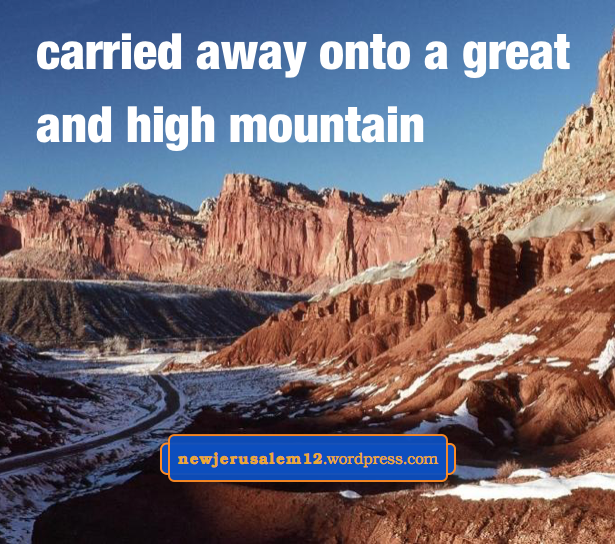 Two thousand years ago John saw “New Jerusalem, coming down out of heaven from God, prepared as a bride adorned for her husband.” John had been carried away in spirit to have this eternal view, unlimited by time*. In our human life in time, we need to cooperate with the Spirit for the preparation of the bride by the growth, perfecting, and renewing in Ephesians and Colossians. Another aspect of the preparation of the bride is in 2 Corinthians 11:2, “For I am jealous over you with a jealousy of God; for I betrothed you to one husband to present you as a pure virgin to Christ.” For this, Paul urges us to stay with “the simplicity and the purity toward Christ” (v. 3). 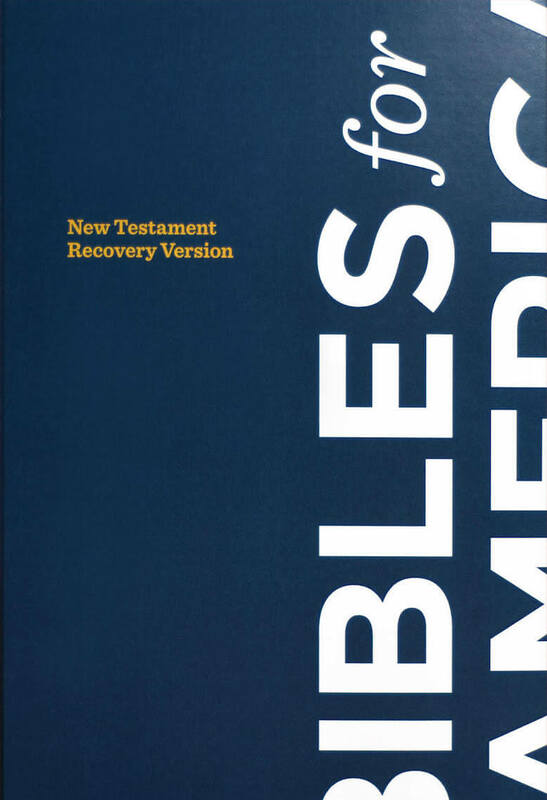 We hold to the Jesus we received, the Spirit who regenerated us, and the gospel presented to us in the Bible (v. 4). 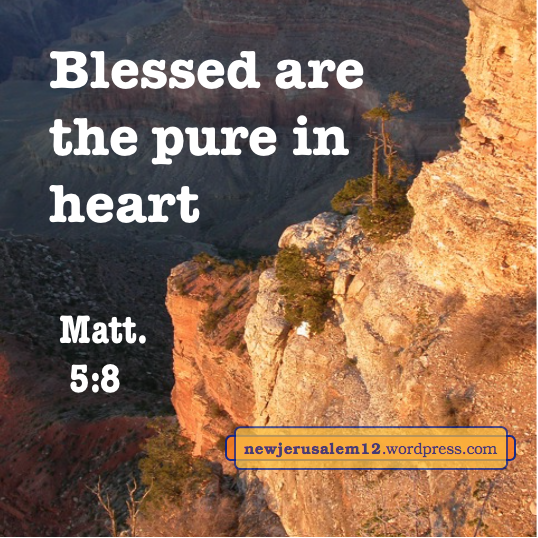 Matthew 5 also speaks of the pure in heart. To be pure in heart is to be single in purpose, to have the single goal of accomplishing God’s will for God’s glory (1 Cor. 10:31). Ultimately the goal and the glory are New Jerusalem. Our pure heart is also in 2 Timothy 2:22, “flee youthful lusts, and pursue righteousness, faith, love, peace with those who call on the Lord out of a pure heart.” A pure heart is a single heart without mixture, a heart that seeks only the Lord and takes the Lord as the unique goal. Lord, draw us daily to Yourself as our unique goal to purify us unto New Jerusalem. In Matthew the Lord Jesus tells us three times that He will come again in glory. He will come in glory and the church will be glorious. The two will match, as Bridegroom and bride. This matching in glory will consummate in New Jerusalem. An angel said to John, “Come here; I will show you the bride, the wife of the Lamb….the holy city, Jerusalem, coming down out of heaven from God,having the glory of God” (Rev. 21:9-11). 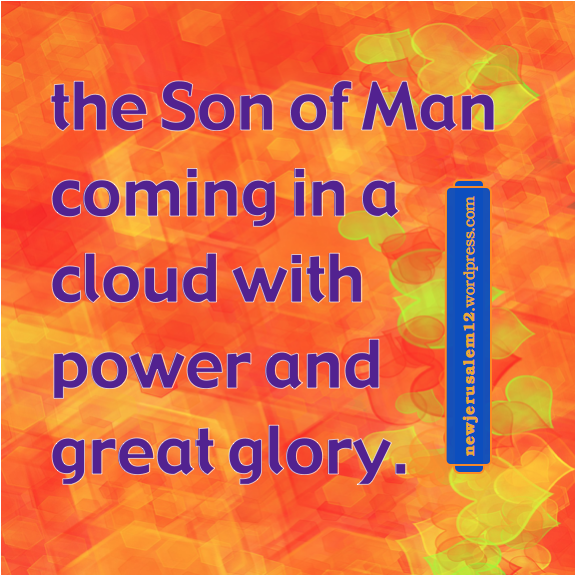 The glory of the Lord’s coming and the glorious church become, for eternity, the glorious New Jerusalem. “The city has no need of the sun or of the moon that they should shine in it, for the glory of God illumined it, and its lamp is the Lamb.” New Jerusalem is glorious because the glory of God enlightens it and radiates through it. In Matthew 25 the Lord spoke a parable about a wedding feast. When the bridegroom came, those who were ready went in with him to the feast. This parable is a picture of the real wedding feast, with the Lord as our Bridegroom and New Jerusalem as His bride, who has made herself ready. • the foolish called the bridegroom Lord (v. 11); unbelievers don’t do this. The conclusion of the parable is “Watch therefore” (v. 13). Watch, pray, let the Spirit fill us. “Set your mind on the things which are above, not on the things which are on the earth” (Col. 3:2). 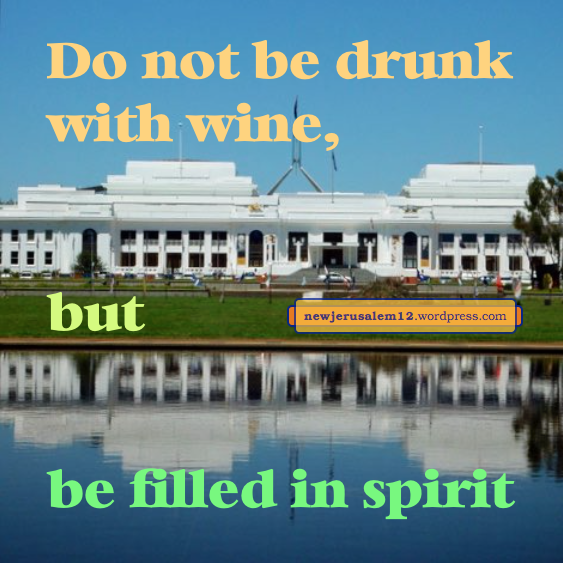 “Do not be drunk with wine [neither physically nor with worldly pursuits], …but be filled in spirit” (Eph. 5:18). We don’t wait passively for New Jerusalem; we pursue now to be filled and ready for the wedding feast! 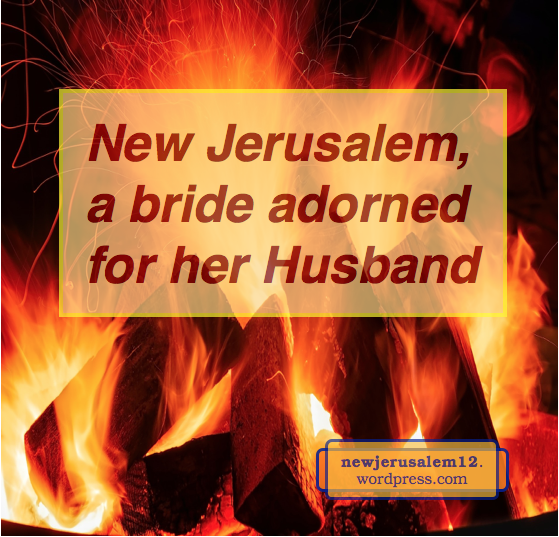 New Jerusalem is “the bride, the wife of the Lamb.” “Let us rejoice and exult, and let us give the glory to Him, for the marriage of the Lamb has come, and His wife has made herself ready” (Rev. 19:7). In Matthew 24 the Lord spoke to us about being ready. Three keys here are living contact with the Lord’s word, loving God, and watching in prayer. 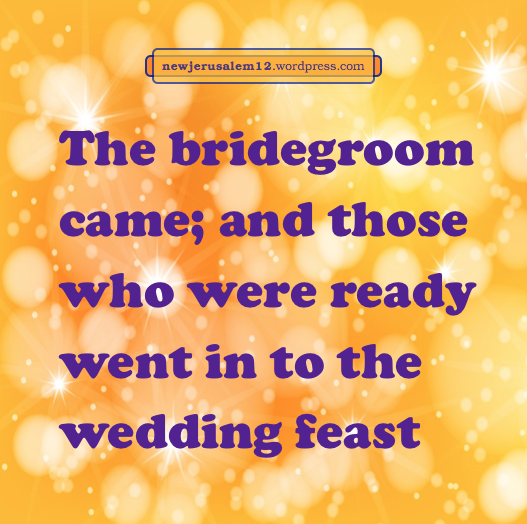 In Matthew 25 He continued with a parable about being ready for a wedding feast, which depicts the real wedding feast with Him, the feast tied to New Jerusalem. Matthew 25:10: “The bridegroom came; and those who were ready went in with him to the wedding feast.” The key to readiness is being filled with the Spirit. signified in this parable by oil in the vessels. God created man with spirit, soul, and body. Due to the fall of man, man’s spirit was deadened and his soul became the self. In regeneration the Spirit enlivened our spirit. Now there is a need to deny our self by exercising our spirit to take our cross daily so that the Spirit may spread from our spirit to saturate our soul. One aspect is Ephesians 4:23, “be renewed in the spirit of your mind,” a part of our soul. To be ready, we need to deny our self in its ambitions, pride, pleasures, complaints, and many other things, and instead seek the Lord in His word, in prayer, in rejoicing, in singing, both alone and with other believers. This is our path to readiness on our way to the wedding feast and New Jerusalem.